The Permablitz originally started in Australia. The idea behind these events is to help individuals realize their own permaculture designs on their own property with help from the community. We have co-opted this idea and expanded it to spread permaculture design as far and wide as possible while keeping the community involved and informed. Everyone can learn skills and knowledge while helping others have a flourishing and functional edible forest or garden of their own. These workshops are meant to reach out to the community by joining together skilled and like minded volunteers to build public and residential perennial food gardens and food forests. The Austin Permaculture Guild previously hosted one permablitz a month starting in January of 2013 with a break for the hot summer months. Currently APG is no longer hosting these events once per month. Although, if you are a graduate of our PDC and would like assistance in organizing your own Permablitz, please reach out to us! At previous permablitzes, we would generally install one or many berm and swale systems on contour. This strategy can be a great tool for slowing and sinking water in urban landscapes in Texas. 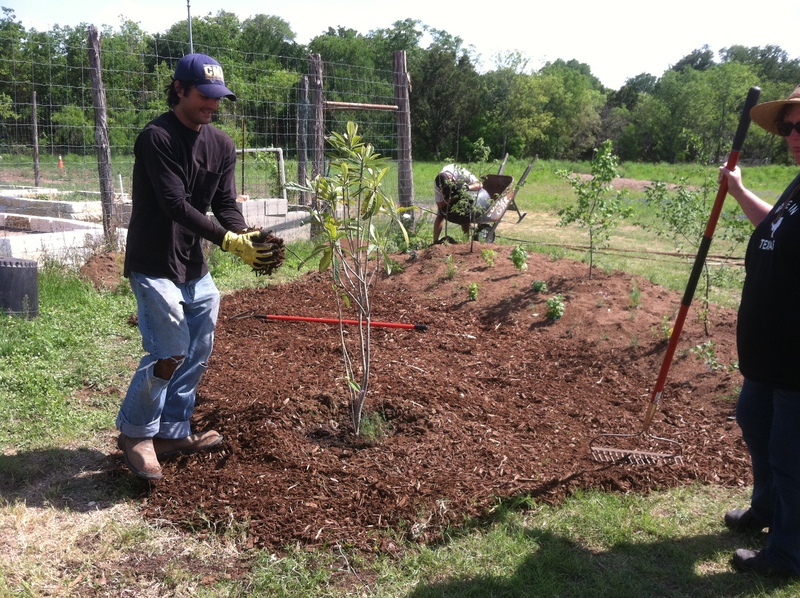 Ideally each of these berms are planted with all 7 layers of the food forest system including native and cultivated fruit and nut trees, nitrogen fixing farmer’s trees, shrubs, perennial vegetables and herbs, root crops and vines. 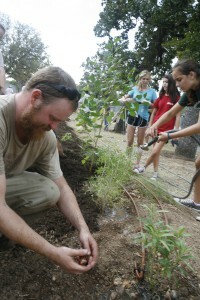 We try to use the most drought tolerant and adapted plants to Central Texas that we can find. Some good examples of perennial plants installed are grapes, blackberries, asparagus, and sun chokes to name a few. These systems are the initial steps to growing a self sustaining perennial garden system. You can be a sponsor with your logo here!